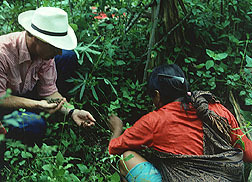 Botanist David Williams, with the International Plant Genetic Resources Institute in Cali, Columbia, receives a peanut landrace from a native farmer in the Amazonian lowlands of Ecuador. Peanuts, native to South America, are widely grown on small farms in Ecuador, which may have more varieties of peanuts than any other country in the world. The crop is planted in slash-and-burn plots in the rainforests of the Amazonian lowlands in the east and in small fields on the sandy coastal plains. Ecuadorian farmers also grow peanuts on irrigated terraces along river valleys in the dry southern mountains. In the northern part of the country, they grow them at high altitudes. To find and collect samples of this peanut diversity, Agricultural Research Service plant explorer Karen A. Williams and colleagues from Texas, Colombia, and Ecuador traveled throughout the country in 1995 and 1996. Williams is a botanist in the Plant Exchange Office of ARS' National Germplasm Resources Laboratory at Beltsville, Maryland. Native varieties are commonly known by scientists as landraces. "Landraces," Williams says, "offer rich sources of genes that breeders can use to improve commercial varieties. Resistance to pests, diseases, and environmental stresses are only a few of the useful traits that may be found in these landraces. "For centuries, the people of Ecuador have selected peanuts that grow best under their local conditions and have particular characteristics they prize. Different Ecuadorian cultures have various uses for peanuts and have selected seed for specific traits, such as white peanuts selected exclusively for use in candy," says Williams. In 1983, Donald Banks, an ARS peanut breeder in Stillwater, Oklahoma, collected peanut landraces in three areas of Ecuador: Quito, Guayaquil, and Loja. But large areas remained unexplored, including the Ecuadorian Amazon. "This left major gaps in peanut germplasm collections from Ecuador," says Williams. "So in 1995 and 1996, we attempted to visit every area of the country. The only place we couldn't go was the far eastern Amazonian lowlands, which are accessible only by canoe." Williams' mission was threefold: fill gaps in the U.S. peanut collection, re-establish a national peanut germplasm collection in Ecuador, and strengthen U.S.-Ecuadorian collaboration in peanut and other genetic resources. A peanut landrace of the variety aequatoriana, from Morona-Santiago Province. Williams' 1995 trip included botanist David E. Williams of the International Plant Genetic Resources Institute (IPGRI) in Cali, Colombia; and César Tapia of the Ecuadorian Agricultural Research Center (INIAP) near Quito. 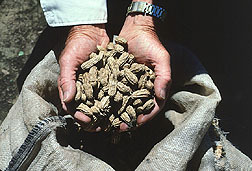 Williams made the 1996 trip with Tapia and veteran peanut explorer Charles E. Simpson of Texas A&M University in Stephenville. "In all, we collected more than 200 accessions of native peanut landraces," Williams says. "The new accessions include landraces of all six botanical varieties of peanuts (Arachis hypogaea): hirsuta, hypogaea, fastigiata, peruviana, aequatoriana, and vulgaris. This shows the broad genetic diversity of peanuts available in Equador. Some of the landraces were previously unknown to science." Of the several aequatoriana landraces they collected, only two were previously known. "Ecuador is the center of diversity for aequatoriana, which has large, rough-looking pods containing three to five colorful seeds," Williams says. "Peanuts of the rare hirsuta variety, named for their densely hairy stems and leaves, were also collected. The hairs may deter insects from feeding and laying eggs. The hirsuta peanut is believed to tolerate cold and drought better than other peanuts. In the northern highlands near the Equator, we found a hirsuta landrace at an altitude of 8,790 feet--the highest altitude of any peanut ever collected," says Williams. Ecuador gained from collaborative activities that resulted from--and reached beyond--the plant explorations. "The political climate for germplasm exploration has changed dramatically in recent years," Williams says. "International agreements have caused some countries to place restrictions on distribution of germplasm. To keep the doors of exchange open, it is increasingly important for the U.S. Department of Agriculture to find new ways of collaborating with countries that provide germplasm." After germplasm is collected, plants must be multiplied and their characteristics scientifically detailed, or described, before they are distributed to plant breeders. Rather than increase and characterize the Ecuadorian peanut collections in the United States--the standard procedure--this work was performed in Ecuador by Ecuadorians under contract with USDA. The increased seeds were divided between the United States and Ecuadorian national plant collections. ARS arranged for Charles Simpson to travel to Ecuador to train the Ecuadorians in methods for peanut characterization, using the USDA Peanut Descriptor List--a standardized set of details about peanuts. "In addition to gaining a fully increased and characterized peanut collection, the Ecuadorians now have the technical knowledge to manage it," says Williams. "These joint efforts make sense to both countries," she says. "Each would have had to increase and characterize the same accessions--a duplication of effort--if this project had not taken place. We accomplished the same goals at a much lower cost to both countries. And we initiated interactions between Ecuadorian and U.S. peanut scientists." Another feature of this collaboration was making use of the ARS peanut collection to restore the Ecuadorians' set of germplasm collected in 1983 by ARS' Donald Banks. That material had been lost in Ecuador because of inadequate storage conditions. "Ecuador now has a new, state-of-the-art national genebank where this repatriated germplasm can be safely stored," Williams says. 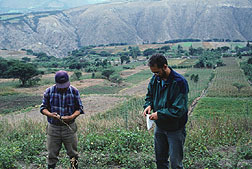 A farmer (left) and César Tapia, who is with the Ecuadorian Agricultural Research Center, examine a rare peanut grown in the highlands of Imbabura Province, Ecuador. Other activities resulting from the peanut explorations will benefit Ecuador and other countries. An example is a new Geographic Information System (GIS) for Ecuadorian peanut germplasm that will correlate locations of Ecuador's peanut landraces with environmental, socioeconomic, and cultural variables. "The GIS will help zero in on peanut diversity in Ecuador and other countries and will thus aid in planning future peanut explorations," says Williams. It will also help match environmental requirements of landraces with other locations for possible new introductions. USDA, IPGRI, and the International Center for Tropical Agriculture are collaborating to develop the GIS. In addition, the landraces are being cataloged. The work is being done by a world authority on their taxonomy, Antonio Krapovickas, at the Northeastern Botanical Institute in Corrientes, Argentina, in collaboration with ARS. The catalog will build on previous unpublished descriptions of Ecuadorian landraces and include taxonomic keys, descriptions, illustrations, and distribution maps. "When completed, this catalog will substantially increase the usefulness of the collections and," Williams says, "be a helpful tool for monitoring these resources on the farms where they are being grown. "We won't know how many landraces of each variety, such as A. aequatoriana, or how many total landraces we collected until Krapovickas' study is finished," she says. "The projects stemming from the peanut explorations in Ecuador show the mutual benefits that result from international collaboration in plant genetic resources," says ARS horticulturist Allan K. Stoner. He heads the National Germplasm Resources Laboratory, which coordinates USDA plant exploration trips worldwide. "Projects like this," says Stoner, "help keep avenues of access open and ensure the continuation of ongoing international efforts to conserve, study, and use genetic resources for the benefit of all." --By Hank Becker, Agricultural Research Service Information Staff. Karen A. Williams is in the USDA-ARS Plant Exchange Office, National Germplasm Resources Laboratory, 10300 Baltimore Ave., Beltsville, MD, 20705-2350; phone (301) 504-5421, fax (301) 504-6305. "Unique Peanuts Bring Nations Together" was published in the September 1998 issue of Agricultural Research magazine. Click here to see this issue's table of contents.